The landscape around Egilsstaðir is as desolate as the economy of much of this region. We take time out in Nielsen's, easily the cosiest café in Egilstaðir, to try and understand why folk in some of the townships of eastern Iceland are none too happy these days. On the steep slopes of a lonely fjord in eastern Iceland, neatly enclosed by a white picket fence, stands an isolated cemetery. The graveyard honours the memory of some four dozen Frenchmen who died while working with the herring and cod fleets in the region. 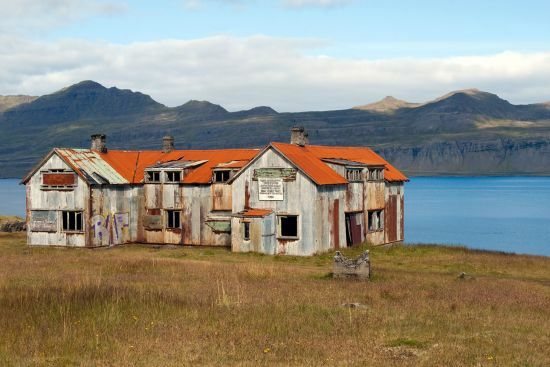 For some decades from the late eighteen seventies, French settlers maintained a fishing station in Fáskrúðsfjörður. They lived well as buoyant fish stocks yielded a steady income. Eventually the fish disfeature appeared and so did the French fishermen, but not before bequeathing to their few Icelandic neighbours a taste for cognac. The one remaining village on Fáskrúðsfjörður is Búðir, a hangdog sort of place that has the feel of a community bypassed by both history and the main road. The latter was diverted four years back. It tunnels through a mountain, so that nowadays most travellers exploring the coast miss Búðir. Few take the trouble to turn off toinvestigate the village with its curious legacy of French street names. You don’t expect to run across a rue du port or a chemin de l’école in the Icelandic wilds — but you do in Búðir. The bar of the Bjarg Hotel in Búðir is the place to be. At least, that’s Ingólfur’s take on local life. He’s a regular at the Bjarg. Ingólfur makes a single beer last all afternoon while the presenter on the television screen above the bar relays news of the Icelandic economy. Bad news. “It is always bad news,” says Ingólfur. The men chat about the struggling króna and muse on a new refinancing package for an Icelandic bank. Nowadays everyone in Iceland is an expert on macroeconomic policy. The one thing Ingólfur will not discuss is the contentious plan to reimburse the British government for compensating British investors who lost funds in the Icesave debacle. Outside the bar, the distant fjord is achingly beautiful. “But landscape does not feed you,” says Ingólfur. “Look. One by one the farmers on both sides of Fáskrúðsfjörður have given up. This is Iceland. It is us versus the elements, and guess who wins?” Ingólfur is bitter. In Fáskrúðsfjörður, the story of economic and social decline is dramatically symbolised by the gaunt outline of the old French hospital. It is a hollow shell of rusting corrugated iron near the seaward end of the fjord. This is a different Iceland from the one that has been so consistently depicted in the media over the last year and more. Unlike pre-recession Reykjavík, there was never any glitz around Fáskrúðsfjörður. No-one ever drove a Porsche. And nobody in the country’s remote eastern communities sheds tears for the Reykjavík bankers who lost their jobs and smart cars as Iceland’s economy collapsed in chaos in early October 2008. Seventeen months on, and Iceland has a new government led by the social democrat that Ingólfur refers to as Saint Jóhanna. Athough Jóhanna Sigurðardóttir is undoubtedly very astute, only time will tell whether she really can work a miracle with the Icelandic economy. This is just an excerpt. If you are a subscriber to hidden europe magazine, you can log in to read the full text online. Of course you can also read the full article in the print edition of hidden europe 30. This article was published in hidden europe 30.